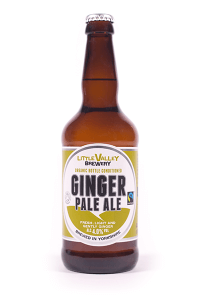 Fairtrade Fortnight begins on the 27th February, so what better way to celebrate than with our Ginger Pale Ale!? Our Ginger Pale Ale is the UK’s only Fairtrade certified beer, as well as being vegan and organic. Goes well with: A spicy meal – Enjoy with a curry! The story: We chose to develop a Ginger Pale Ale as a means of expressing our support, particularly for farmers in the developing world, but at the same time not to neglect our own farmers here in Britain. It means that this beer is made with both ingredients that we can easily source in the UK as well as other ingredients we can’t source in the UK. We can’t source sugar cane and ginger in the UK so it’s a win-win for farmers all round! Ingredients: Whilst 95% of our barley for our beers comes from the UK, the other 5%, which we can’t get from the UK, comes mainly from Germany. We source the ginger and sugar cane for our Ginger Pale Ale from Paraguay, Sri Lanka and India.